Despite Microsoft's announcement that 2012 will be its last CES, the technology trade show is poised for the biggest turnout in years. Riding a wave that has seen launches of tablets, Android devices and connected TVs over the past couple of years, the upcoming International Consumer Electronics Show in Las Vegas looks for another booster shot of relevance despite Apple's continued absence and Microsoft's recently announced swan song. Momentum carried by recent years of increased key announcements and positive trade show numbers may have taken a hit with Microsoft announcing that the 2012 show will be its last as an exhibitor and keynoter. In a blog post, Frank Shaw, Microsoft's corporate communications vice president, wrote that the company's product news milestones "generally don't align" with the January timing of CES. "As we look at all of the new ways we tell our consumer stories -- from product momentum disclosures, to exciting events like our Big Windows Phone, to a range of consumer connection points like Facebook, Twitter, Microsoft.com and our retail stores -- it feels like the right time to make this transition," Shaw wrote. Time will tell whether another tech event will benefit from Microsoft pulling out of the show. CES, however, has been on the positive end of another trade show's demise. The collapse of COMDEX in 2004 -- which some industry observers attribute, in part, to IBM abandoning the show in 1997 – laid out the welcome mat for non-traditional companies to make major announcements in Las Vegas each January. A recent example is Ford Motor Co. launching its Ford Focus Electric at the 2011 CES instead of the North American International Auto Show. COMDEX's fall also opened the door for CES to become the No. 1 trade show in the United States by attendance. CES registration jumped the first 3 years there wasn't a COMDEX, including 2006 when a record 152,203 attended. The economic downturn saw numbers drop until 2010, and in 2011 CES was just 471 registrants shy of again reaching the 150,000 milestone. 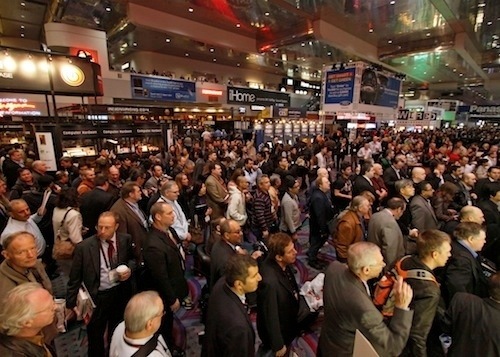 By show floor size alone, CES is the world's largest consumer tech show. The 2012 CES trade show will sprawl across 1.8 million square feet, larger than the 1.6 million square feet of space in 2011. That figure, along with 2,700 exhibitors the hosting Consumer Electronics Association said will be at the show, will equal the 2007 event, held 11 months before what economists peg as the start of the most recent global financial crisis. Long-time CES attendee Danielle Levitas, an IDC analyst, has seen the show's ups and downs first-hand. "It felt like CES was about to explode in 2006, when attendance hit astonishing numbers," Levitas said. "Then the global crisis hit and understandably, attendance dropped. But it has rebounded and seems to be going strong." For the worldwide media and analysts covering CES, the number of attendees and square footage pale in importance compared to the show-and-tell over four busy days. The CEA expects more than20,000 new products to be launched at the show, which has one veteran product reviewer upbeat. "A few years ago there was a sentiment that CES was becoming less relevant because of certain companies dropping out and other reasons, but you don't hear that lately," said Steve Kruschen, better known as "Mr. Gadget" to television and radio audiences. "What's helped is adding new things," said Kruschen, who is about to attend his 29th CES. "I've long been an advocate that the CEA expand in housewares, which I call kitchen electronics, and consumer-type medical equipment. They were missing the boat by not including those types of products for so many years. By doing so they've kept CES more relevant than ever." As for the 20,000 product launches organizers said will be made at CES, Kruschen said exhibitors can actually help the show maintain its significance by taking a less is more approach. "From tablets with usability issues, interface issues and other issues to products that don't fill a need or have an audience -- we journalists are constantly amused, and not in a good way, when we ask ourselves, 'Why on Earth did they introduce that at CES?'" Ironically, the same company that Kruschen cited as doing a good job in that department is also absent from the long scroll of 2012 CES exhibitors. "Apple focuses its stuff at a time and place of its choosing, only introducing a product when it's ready," he said. "Too bad others don't do the same." Apple, which in the past said that coming up with a dazzling show and mind-blowing new products every January was "unsustainable," may still be the biggest elephant in the room, but it won't be invisible at CES. Apple will be represented by several attendees, according to the CEA, and it will have strong presence at the expanded iLounge pavilion for companies in the business of Apple hardware and accessories. Just as CES draws attendees and exhibitors from many walks of commerce, so does the city that has hosted the event since 1978. Las Vegas is expected to be named North America's No. 1 trade show destination for the 18th straight year when Trade Show News Network's 2011 list is announced. "CES was one of the first to come here on an annual basis, and it's been great to watch it grow along with Las Vegas as a destination," said Jeremy Handel of the Las Vegas Convention and Visitors Authority. For the local hospitality scene, CES kicks off the convention season in a big way. MGM Resorts International, whose portfolio includes some of the biggest names on the Strip, said that CES is the highest-grossing trade show for the company annually, even in less than stellar years. Bellagio, Mandalay Bay, The Mirage, MGM Grand and other major Las Vegas properties. By the time the last Teamster clocks out, CES 2012 is expected to bring in over $153 million to the Las Vegas area, according to the convention authority, and that doesn't include what attendees will drop in the casinos. "That's a lot of relevance," Handel said.